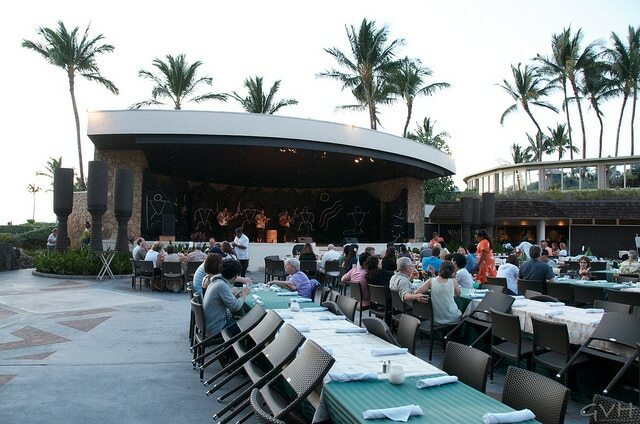 Enjoying a Hawaiian luau is a great activity to plan into your vacation – especially for the first-time visitor. If you are considering a luau, we want to give you an idea of what to expect along with advice to help you make the most of your experience. Though the cost of a luau can vary by island and venue, plan on a minimum of $90 to $100 per adult. Most luau companies consider an adult guest to be anyone 13 years and older. For children between the ages of 6 to 12 years, plan to spend a minimum of $60 per child. Children age five years and younger are usually provided free entrance along with a paying adult. What’s included in a luau? The cost of a luau usually includes a buffet dinner, drinks, a Polynesian dance and music show and gratuities. Many, but not all luaus include a lei greeting. What’s included can vary so be sure and verify what is and isn’t included at the time of booking so that you won’t have any surprises. What’s the typical format of a luau? Most luaus offer some sort of lei greeting. The higher end luaus greet guests with a fresh flower lei or nice kukui nut lei. Some luaus offer a shell lei, while a few luaus provide no lei at all. Check directly with the luau companies you are considering to determine what sort of lei greeting they provide. Drinks are normally offered and included in the price of the luau. Normally luaus offer an open bar, but the cocktail selection may be limited to Mai Tai and a few other iconic tropical drinks. Bear in mind that the lines at the bar can be quite long during peak demand. Most people report that luau cocktails are quite light on alcohol. While guests arrive, Hawaiian arts and crafts demonstrations are usually set up around the luau grounds. Some luaus may offer games. Prior to sitting down to dinner, most luaus have an imu ceremony. An imu is an underground oven that cooks meat, normally pork, with hot coals. There’s really not much in the way of a ceremony per se, but it’s interesting to observe the process and to see the way Hawaiians have used imus for centuries. There may be some sort of Hawaiian musical entertainment as people take their seats at the dinner tables. With the exception of the Feast at Lele, you should expect to share a large table with strangers. Almost every luau serves dinner in a buffet style. 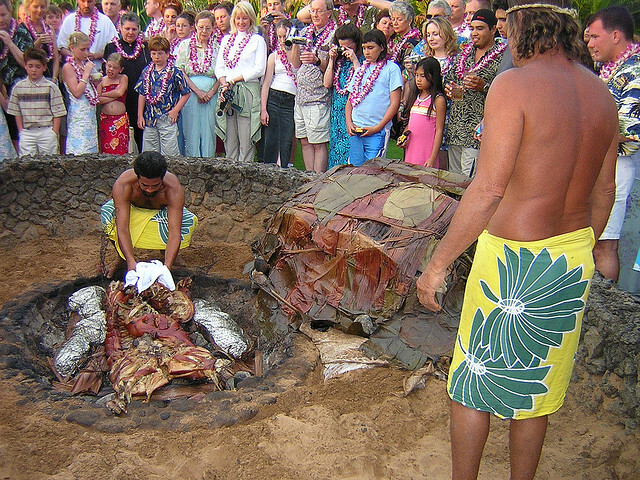 A typical buffet will feature kalua (chopped) pork, which roasted in the imu. Fish and chicken dishes are also normally included. For an example of a luau menu see this link. After dinner, the Polynesian dancing show begins with featured costumes, music and dancing from all the major Polynesian island cultures. 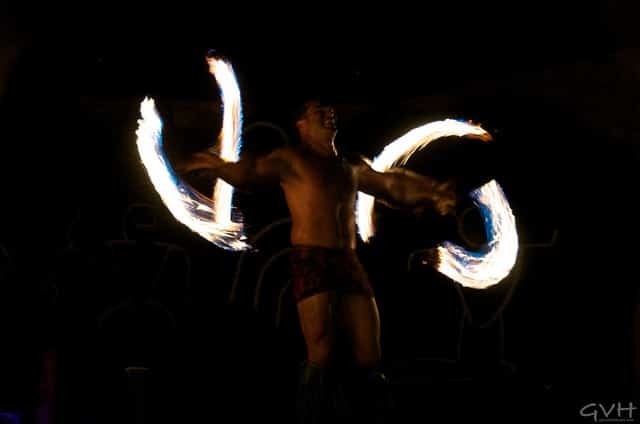 The grand finale of a luau normally ends in a Samoan Fireknife dancer. The only luau that we are aware of that doesn’t offer a Fireknife dance finale is Old Lahaina Luau. A brave luau dancer performing a Samoan fireknife dance. How far ahead should you book a luau? To get the luau that you want, it’s best to book as soon as possible — weeks ahead of your trip. Some luau companies will seat guests in the order of booking. In those cases, the sooner you book, the better your seating/view may be. If you get to Hawaii and you didn’t booked ahead, don’t worry, you will most likely still find a luau to attend. A hotel or island concierge will be able to advise where to go in short notice situations. What to wear to a luau. Comfortable clothes are always appropriate in Hawaii. Most ladies wear nice shorts, slacks, or capri pants and a blouse or a casual sundress. Khaki shorts and an Aloha (Hawaiian) shirt tend to be the attire of choice for men. You might want to bring a light sweater in the winter months. After sunset, the air can get slightly chilly. – Ideas for what women should wear on a Hawaii vacation. – Suggestions for what men might want to wear on a Hawaii vacation. 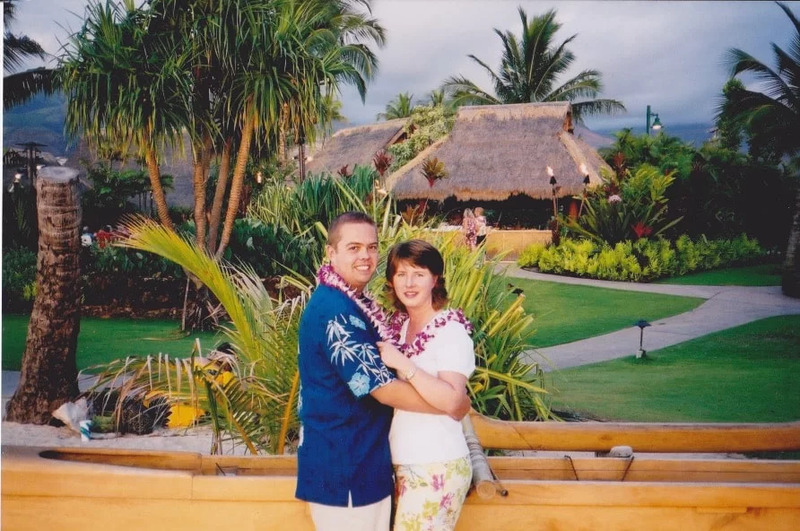 Our first luau in 2003. When to go to a luau on your Hawaii vacation. Unless you really know that you’ll get over jet lag quickly, we don’t recommend going to a luau on the first night or two of your vacation. Give yourself a day or two to adjust to Hawaii time so that you won’t be tired and sleepy at the luau. You can find a luau on just about every evening of the week, but not every luau is offered every night. Many resort-based luaus are only offered two or three evenings per week. Make sure you consider the nights of operation as you evaluate your luau options. When to arrive at your chosen luau. Some luaus assign seats while others seat of a first come, first served basis. Check directly with the luau you choose to determine the seating process and their advice of when to arrive. While guests mill around the grounds before the festivities begin, if they don’t have assigned seating, they normally save their seats by tilting and propping their chair against the table. See the below photo for an example. Most luaus offer upgraded seating that’s close to the entertainment stage. The upgrades might also include other perks like a nicer lei and better service. Upgrade fees vary, but average around $20 to $30 per person. If your budget allows, upgrading normally provides a better experience. Luau setting at Hilton Waikoloa Village. Note that the round tables beside the stage are the upgraded seats. The rectangular tables in the foreground are standard seats. These island luau lists include links to reviews, which provide useful insight. When available, check out photos uploaded by reviewers. Those photos will be much more representative of a real experience as compared to the attractive brochure photos. Are luaus in Hawaii authentic? There are some elements of a luau that are authentic to the Hawaiian culture — like Hawaiian hula dancing, Hawaiian mele/chants and some of the food being cooked in an imu. There are also other Polynesian cultures represented in luaus — e.g. 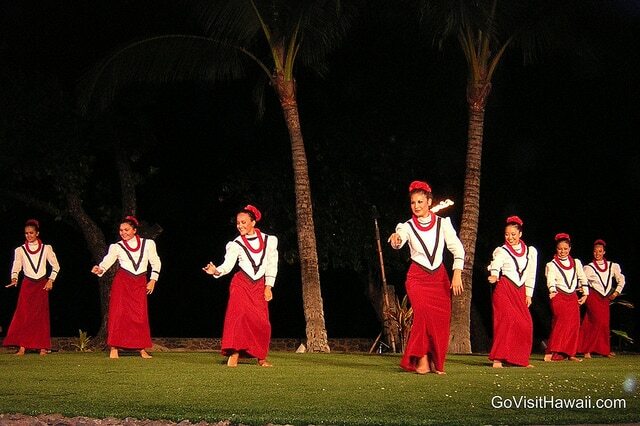 Samoan fireknife dancing, Maori dances including the haka, and dances and songs from Tahiti, Tonga, Fiji and Marquesas. For a brief history of a Hawaiian luau, see this link. Have you been to a luau on your Hawaii vacation? Where did you go? How was your experience? Great advice and love all the links too. Gotta eat dinner anyway, might as well do a luau and get entertainer too! We’ve been to Feast at Lele on Maui in Lahaina 3 times now and we highly recommend. You get your own individual table whether it’s just 2 of you or a group. Open bar all night with every kind of tropical drink. Well worth it!